Tannhäusser sheet music, including the Complete Scores for both the Dresden and Paris version. ACT I: Medieval Germany. 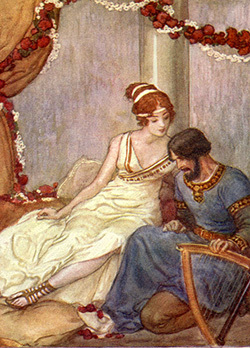 In the Venusberg, magical mountain abode of Venus, the minstrel Tannhäuser halfheartedly praises the goddess of beauty, who for more than a year has bestowed her love upon him. Venus promises greater revels when Tannhäuser asks for his freedom, but she curses his hopes of salvation when he longs for the simple pleasures and pains of earthly life. In response he calls on the Virgin Mary, and the Venusberg vanishes. Tannhäuser finds himself in a sunny valley near the castle of the Wartburg, where passing pilgrims inspire him to laud the wonders of God. Horns announce the Landgrave Hermann and his knights, who recognize their long-lost comrade and invite him to the castle. One of them, Wolfram von Eschenbach, reminds Tannhäuser that in the past his singing won the love of Elisabeth, the landgrave's beautiful niece. On hearing her name, Tannhäuser embraces and joins his companions. ACT II: In the Hall of Song in the Wartburg, Elisabeth hails the place where she first heard Tannhäuser's voice. Wolfram reunites the happy pair, who sing God's praises. As guests arrive, the landgrave promises Elisabeth's hand to the winner of a contest of love songs. Wolfram delivers an idealized tribute to Elisabeth, whom he too has loved. Tannhäuser, his soul still possessed by Venus, counters with a frenzied hymn to the pleasures of worldly love. Everyone is shocked, but Elisabeth protects Tannhäuser from harm, securing her uncle's pardon for her beloved on the condition that he make a pilgrimage to Rome to seek absolution. ACT III: Several months later, Wolfram discovers Elisabeth at evening prayer before a shrine in the Wartburg valley. She searches among approaching pilgrims for Tannhäuser, but in vain. Broken, she prays to the Virgin to receive her soul in heaven. Wolfram, alone, asks the evening star to guide her on her way. Tannhäuser now staggers in wearily to relate that despite his abject penitence, the Pope decreed he could as soon be forgiven as the papal staff could break into flower. The desperate man calls to Venus, but she vanishes when Tannhäuser is reminded again by Wolfram of Elisabeth, whose funeral procession now winds down the valley. Tannhäuser collapses, dying, by her bier. A chorus of pilgrims enters, recounting a miracle: the Pope's staff, which they bear forward, has blossomed.